Provence has attracted artists, celebrities and papparazzi for years yet still retains the charm of the average countryside. Mountain top villages, blue skies and seas, delicious food, screaming cicades, pine forests and the mistral have formed a wonderful playground for visitors. For more information on Marseille, please visit our Marseille Travel Guide. This charming city was once the capital of Provence and is about 30 minutes away from Marseille by car. Aix brims with culture, art and class. When there, you can visit the local artisan markets, the museums, stroll down the Cours Mirabeau or sit at one of the many renowned cafés of the Cours. One of the most notable is "Les Deux Garçons" in "Vieux Aix" or old Aix and boasted Cezanne as one its many patrons in the past. Other attractions in the city are Atelier Cézanne, Cathédral St-Sauveur, its many varied fountains, nightlife, exquisite boutiques and the odd star strolling down the Avenues going about their daily lives. Aix is also home to one of the best markets in Provence. The market is held on every other day and it does get crowded on market day so get there early. 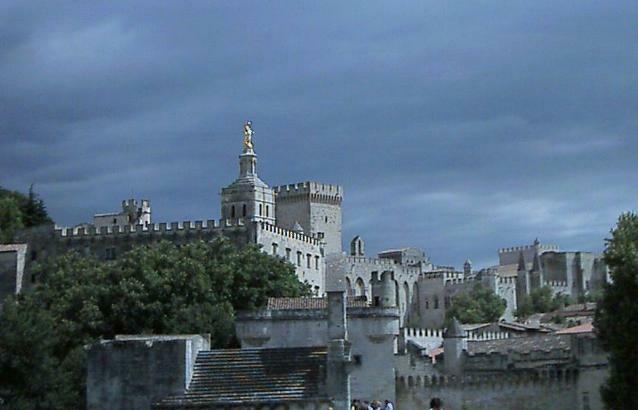 Avignon is an ancient Papal city on the Rhone river, surrounded by fortifications. The city rose to prominence in the XIIth century because of its famous bridge, le Pont d'Avignon or more officially, le Pont St-Benezet. Later on, the papacy was installed in the XIVth century when Clement Vth came to Avignon. It is still to this day a cultural and economic power in Southern France and boasts great attractions. Pont D'Avignon - The famous bridge was once the only bridge across the Rhone River and contributed greatly to the growth of Avignon. The bridge was begun in 1177 and ended in 1185. It should be noted that you cannot cross it anymore, it no longer stretches the span of the river. 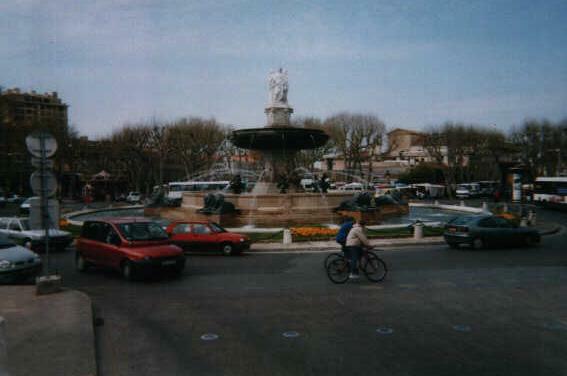 Arles is famous for its ancient Roman arena and was the capital of Gaul in Roman times. It is also located on the Rhone River. Sites to visit are the Roman Arena, the Archaelogical museum, the antique theatre, place de la Republique and the Cathedrale St Trophime. The city is also well known for having hosted Vincent van Gogh and Gauguin as residents. With all these sites of interest and a rich history contribute to Arles getting quite busy during the tourist season which runs from July to August. There aren't loads of people, but there are enough. 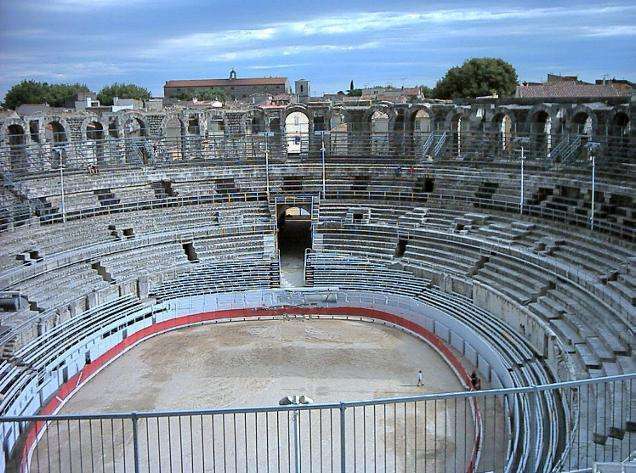 Of particular interest in Arles is the "Feria" which is held over Easter period each year and includes bullfights in the Roman Arena. Famous around the world the Côte d'Azur lies on the southern end of Provence and it's Coast. The azur blue of the Mediterranean sea and the hot dry weather has drawn tourists for centuries seeking to relax, enjoy the sun and play. You can experience the chic of St Raphael, the glam of Nice and Cannes, the wilderness of the Camargue, the ruggedness of the Calanques in Marseille and the bustle of Les Lecques. Enjoy and soak up some sun. The Lac de Ste-Croix is a man-made lake located about 20 minutes from Aups. The lake was formed by the damming of the Verdon river in the mid 1970s. The water is a beautiful clear turquoise and offers joy seekers the opportunity to windsurf, canoe, kayak, pedalo, fish and swim. Beaches and picnic areas line the lake and can accomodate plenty of visitors. 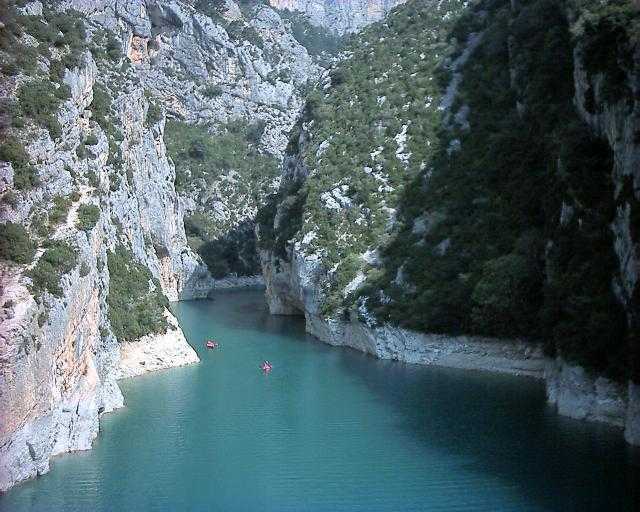 The Gorges du Verdon are a small version of the Grand Canyon where the river Verdon itself flows down from the mountain peaks above. There are roads lining the gorges which you can drive or cycle on but be wary, they are quite twisty. Along the way, you may want to stop and gaze from the vantage points at the river below. You can also stop at the Galetas bridge to have a look at the starting point of the lake. Above the lake, visit Aiguines, a quaint vilage at an altitude of 800 metres filled with shops, cafes and wonderful views of the lake and its surroundings. Montfort is small village in the heart of provence where traditional values and village life still thrive. 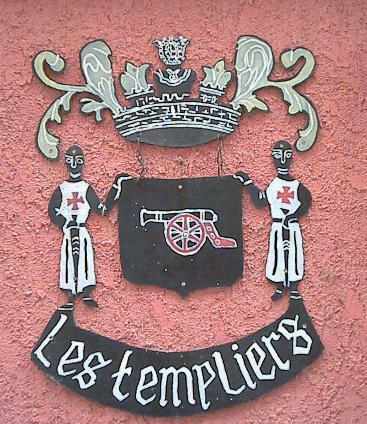 Of particular interest in the village are the old castle at the top of the hill and the wine Cooperative "Les Caves du Commandeur". Les Caves du Commandeur produces some excellent wines including Rose, Cabernet Sauvignon, Merlot and a white Rolle. The grapes are sourced from the local producers. Sillan is a quaint little village between Cotignac and Aups in the heart of Provence. 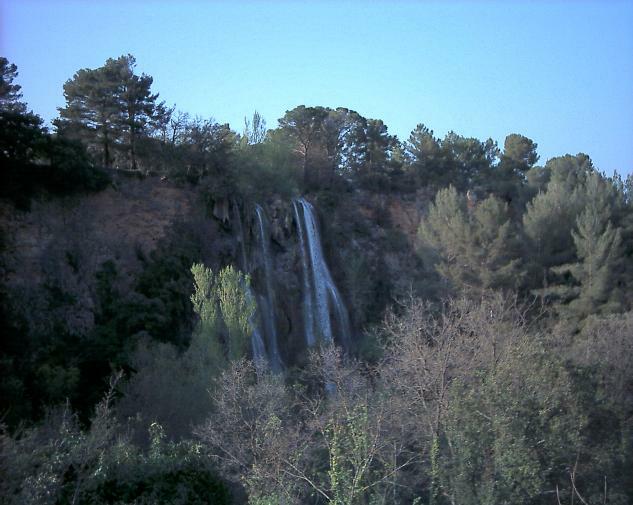 The main reason people come to Sillan is for the 10 minute walk to the river for a good viewing point of Sillan's Waterfall. The water falls over 100 metres to ground level to join the rest of the aquamarine river below. Cotignac is small quaint village just past Montfort. The village has experienced rapid growth in the last few years and has developed into a bit of a tourist hub. Particular points of interest are the market on Tuesdays and Notre Dame church overlooking the village and the valley below offering wonderful views. 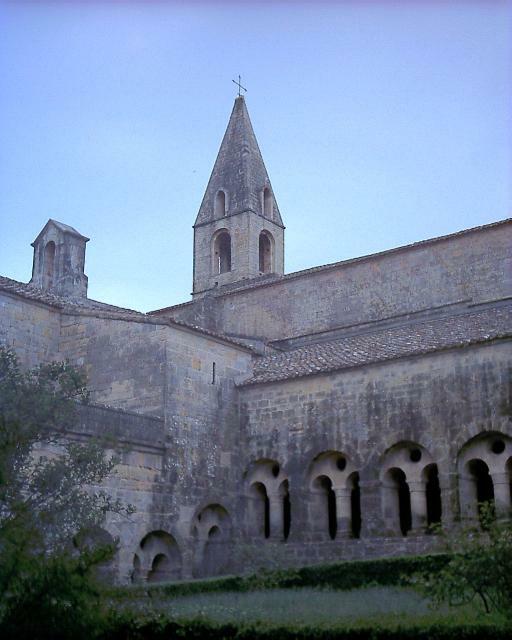 The Abbey of Le Thoronet is just outside the village of Le Thoronet in Central Var. The Abbey goes back to 1160 when Cistercian monks began construction which lasted until 1190. The Abbaye consists of a Church, Armarium, Chapter House, Parlour, Dormitory, Cloister, Lavabo, Cellar and the quarters for the lay brothers. The Abbey has been kept in wonderful shape and is definetely worth a visit. You can find out more about the Abbey at www.monum.fr. To the west of Marseille is the Camargue, a wild stretch of coastline where the Camargue Nature Park lies. In the park you may encounter the Camargais, cowboys specific to the region, and their livestock of horses and bulls. Ste Marie de la Mer is the coastal village in the Camargue and has sights, restaurants and activities to please all. 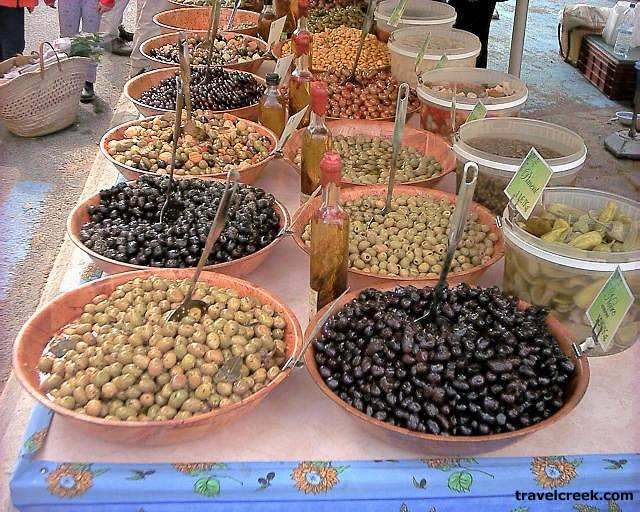 Markets in Provence are held in different villages and towns on alternating days. You'll find flowers, clothing, fruits and vegetables, cheese, olive wood carvings, meat, artisanal pottery and wine. Typical articles made in Provence include the colourful table clothes, yellow clay plates and bowls. 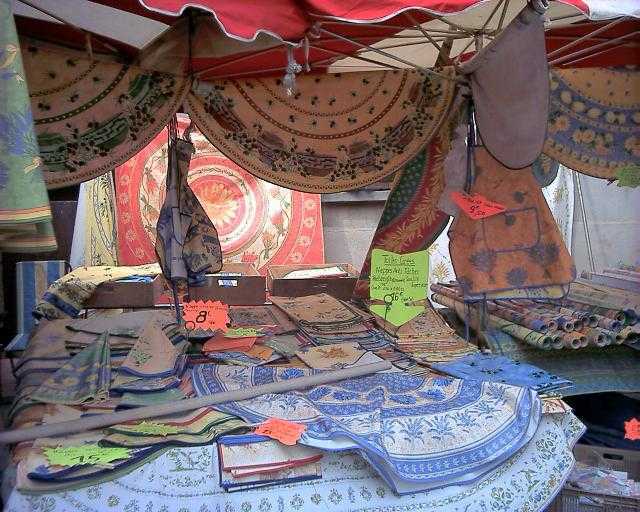 After visiting a few markets you'll get to know what typical Provencal artisanry looks like and an appropriate price. The beaches of the Côte d'Azur are world famous. In the summer months the more popular ones of Les Lecques, around Nice and Cannes get crowded so get there early to find a comfotable spot for your towels. The hills of Provence provide a great walking environment. Many trails are marked and commonly frequented. You can find maps for walks in any tourist office. Wine is a way of life in Provence. You'll be able to see why as you drive or cycle through the countryside. Olives and olive oil play a major role in the Southern French diet and recipes. You can spot Olive trees all over the provencal landscape as proof. This soup, a poor man's meal in old times, consists of rockfish, squid, tomatoes and a variety of spices. Delicious and Marseille's baby. Do book ahead of time and state that you will be ordering a bouillabaisse. Being a major agricultural area, Provence produces some fantastic fruit and veg. Try the apricots, peaches, grapes, tomatoes, asparagus, plums and melons. Salade Nicoise is the best known provencal salad but there are many more to savour. Like the rest of France, cheese is traditionally served at the end of the meal and forms a main part in any meal. Provence is mainly known for its delicious goat's cheese. You can find excellent hotels in Provence. Many of the main hotel sites will have listings for you in Provence. Find Provence Hotels. You'll see many signs on the side of the road advertising this type of accommodation. Chambres d'Hôtes are usually family run rooms available in private homes. Just turn up and see if one is availble. They usually are very affordable. You can find hostels in the major cities of Provence. There are hostels available in Marseille, Avignon, Antibes, Cannes, Aix en Provence, Arles and St Remy. Search for and book accommodation at a hostel in Provence. Campsites form a significant part of the accommodation market in Provence. You can find a campsite in Provence at www.geotour.com. The closest major airports for Provence are the airports of Marseille - Provence in Marignane and Nice. There are also other airports in the region including the airports of Nimes and Hyeres-Toulon, which are about 30 minutes from the heart of Provence. You can get more information on the airport in Marseilles or Nice by visiting - www.marseille.aeroport.fr or www.nice.aeroport.fr. Cycling through Provence is growing increasingly popular and is a wonderful, albeit tiring way of seeing the best of the Provencal countryside. The best way around Provence and the South of France is definitely by car. Rental prices are affordable but gasoline isn't that cheap. Be careful though, the French tend to drive like they are in a race so don't try and compete with them. Walking is an excellent way to explore the hills, forests, valleys and vineyards of the Provencal countryside. The people of Provence and Southern France are worlds apart from their Parisian compatriots. The brashness and arrogance disappears and people will find them warm, friendly and welcoming. French with some people still speaking old Provencal.